Today I am going to share……. the Blue Ridge Mountains, which run down the eastern seaboard of the United States. Aren’t they breathtakingly beautiful? To learn more about Blue Ridge Mountains visit wiki. On my book blog, A Southern Daydreamer Reads, I am starting a Spring Reading Challenge. From March 20- June 20, 2009…. READ! Come join the fun! It’s Pink Saturday, hosted by Beverly at How Sweet the Sound. Be sure to visit Beverly's blog to see a complete list of all the participants in today's Pink Saturday. This week is a special Pink Saturday. Beverly has been the hostess of this blog event for one year now! Congratulations and Thank you Beverly! I know how much time and energy it takes to host a weekly event and we all appreciate all you do! I have met some wonderful people … thanks to you! May your day be filled with lots of pink… and may there be many more Pink Saturdays for us all! I was hoping I would have some pictures of some of my roses this week…but with all the rain we have had lately…they are all a little battered… I really like English roses (David Austin)…and they seem to do well in my yard… Here is a picture of Austin’s Cottage Rose… I hope to have more pictures soon! Since Beverly’s celebrating a birthday/anniversary for Pink Saturday… let’s eat some pink cake! Today I am going to share one of my favorite salads….. Blue Cheese Pecan Chopped Salad. The first time I had it was at Outback Steakhouse (restaurant). It was delicious…so, of course, I had to try to make it home! It sounds “involved” to make…but it is worth it…because it is delicious! Slice each pecan half into three lengthwise pieces. Mix together the cinnamon and brown sugar. Toss pecans with melted butter, then with the cinnamon/sugar mixture, tossing well to ensure a thorough coating. Remove the baking sheet from the oven, slide the parchment together with the nuts off the sheet to cool, and set aside. Place the chopped lettuce in a large serving bowl (one large enough to toss the salad in). Add the vinaigrette and toss thoroughly to coat. Rain, rain go away…come again some other day! We have had alot of rain the last few weeks….. I am ready to see the sun shine for a few days in a row! I wish you could smell these pictures… the gardenias and confederate jasmine are two of my favorite blooms! I have many gardenia bushes scattered throughout my yard…. Look at all the blooms! The blooms are so pretty…. I have a few different varieties…. but I think many of them are called “August Beauty”…….. The blooms on the confederate jasmine are small…but fragrant! They are hardy vines in my yard…….. They stay green all year……. Robyn at There’s Always Thyme for…. PHEW……alot of participants this week… THANKS! adding links manually….You are next…. Memorial Day is a United States federal holiday observed on the last Monday of May (on May 25 in 2009). Formerly known as Decoration Day, it commemorates U.S. men and women who died while in the military service. First enacted to honor Union soldiers of the American Civil War (it is celebrated near the day of reunification after the civil war), it was expanded after World War I to include American casualties of any war or military action. I have my pink pail….. and my pink bag…… and my pink flip flops……. and I am ready!! This is Memorial Day weekend…and many will be cooking on the grill… I thought I’d share a potato salad recipe that is quick and easy… and different! Place potatoes in large saucepan. Add enough water to completely cover potatoes. Bring to boil. Reduce heat to medium-low; simmer 20 min. or until potatoes are tender. Drain. Rinse potatoes with cold water until cooled; drain. Mix remaining ingredients in large bowl. Add potatoes; mix lightly. Cover. Peeling Green-Skinned Potatoes- If potatoes have a slight green tinge to the skin, be sure to peel them before use. The green color is caused by prolonged exposure to the light and contains a substance that can be toxic. 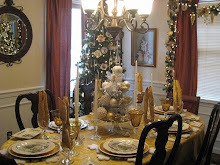 It’s time for Tablescape Thursday hosted by Susan and her blog Between Naps on the Porch. It’s the end of the school year… and time for graduation for many…so I thought I’d share a graduation tablescape! My youngest son went to prom…. and they took a few pictures outside….. so I thought I would share them! This is where I would rather be right now…. in a chair on the beach…… looking at the crystal blue water …. walking along the white sand…..sigh…..